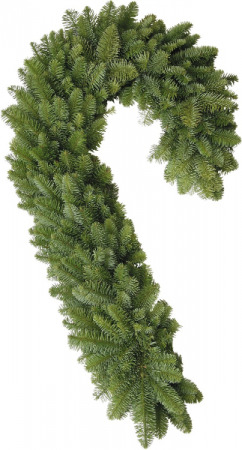 This beautiful plush Noble Fir candy cane comes full of holiday spirit and ready to decorate! Comes with a red bow. 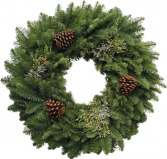 A portion of the proceeds from the sale of this wreath go to our local elementary school! May pre-order but not available until after Thanksgiving! 25 feet of beautiful cedar garland. perfect for doors, mantels and staircases. A portion of the proceeds goes to our local elementary school every year! You may pre-order but these will not be available until after Thanskgiving. Fresh Noble Fir accented with Incense Cedar, Blue Berried Juniper and Ponderosa Pine cones. This wreath is a beauty! Comes with a red bow! We donate a big portion of the proceeds to our local elementary school each year for this wreath! You may reorder but not available until after Thanksgiving.